Gourmet Glatt's acquisition of a second Hashgacha, in addition to being a violation of its contract and policies with the Vaad, is an affront to the unity of our community. When there is one universally recognized and accepted Hashgacha in a community, the kashruth standards are clear to all. When one local store takes on multiple hashgachot on their premises, then there is a threat to the uniform standards we have all worked so hard to achieve. 1. 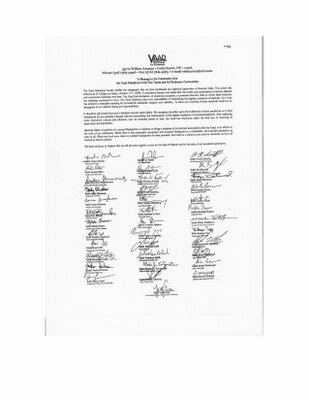 The letter includes no declaration of a boycott. Does this mean that the boycott declared by my Rav isn't in effect? Or is the boycott just for his congregants? Or was he merely making a friendly suggestion? I'm confused. 2. The letter was clearly a team effort. One way to tell is the alternation between "kashruth" and "kashrus" -- in some cases within the same sentence. 3. The letter puts the "second hasgacha" issue in the background and tries to make it all about kashrus (or kashruth). Unfortunately, the opening paragraph refers only to "serious halachic and contractual violations over time" without spelling out what they were. I have started deleting inappropriate comments with a free hand. I will continue to do so, and if people continue to ignore my guidelines for civility in commenting, I will be forced to enable comment moderation. I know full well that enabling moderation does somewhat stagnate the flow of discussion, which would be a pity. So please, no character assassinations or rude comments. Discrimination against haredi girls of eastern origin at seminaries and schools of independent education, which is manifested in many not being accepted into schools, triggered an unprecedented attack Sunday on the part of Rabbi Yaakov Yosef, Rabbi Ovadia Yosef’s son. He was featured on the haredi radio station, “Kol Haemet” (the voice of truth), and urged an appeal to civil courts on the matter. "A terrible situation has been created whereby those heading the schools and seminars are defying the Torah Greats and are doing as they please," Rabbi Yosef said. “I hereby rule that there is nothing wrong with taking such cases to legal proceedings, since they don’t adhere to the Halacha or Torah, and so it is best to turn to the court and any entity in order to stop the shame,” he continued. The haredi community doesn’t normally turn to civil proceedings, but instead relies on religious tribunals that make rulings based on the Torah. For this reason, Rabbi Yosef’s announcement was considered a rare and ground breaking step. Obviously, Rav Yosef thinks the debasement and humiliation suffered by the rejected students by the school systems is more pressing the prohibition against Mesirah Arka'ot - that of taking a claim against another Jew to a secular court instead of a Bait Din. This is an important step, and I hope it actually gets things moving when it comes to the prevention of this disgusting form of racism that has been going on, unchecked, for years. Gubernatorial hopeful Eliot Spitzer said yesterday he favors funneling more state cash to private schools. Spitzer, speaking to Orthodox Jews at a Brooklyn yeshiva, said it is unjust that private schools educate 15% of the state's students but get only 1% of the education budget. "We will work on that," promised Spitzer, a graduate of the prestigious and private Horace Mann High School in the Bronx. The Democratic front-runner does not support vouchers - public funds that can be used to help pay tuition at private schools, his spokeswoman Christine Anderson said. "He believes that measures such as the Child Tax Credit, which was enacted with his support last year, can provide relief for parents who choose to send their children to private school," she said. I do recall him speaking out in favor of the tax credit last year (after a fashion, at least), and I'm pleased to see him reiterate his support for recent attempts by NY lawmakers to find a constitutional solution to deal with the tuition crisis. I read and reread this article, and I'm still scratching my head. Anyone care to tell me what the problem is here? As of Wednesday morning numerous IDF soldiers began reading the Book of Psalms, thanks to the "kind donation of billionaire Aracadi Gaydamak" as written in golden letters on the cover of the books distributed to hundreds of new military recruits. Dov Sharf, a regional cooperation advisor from Eilat, who accompanied his daughter on her first day to the army, couldn't believe his eyes. While the new recruits were boarding the bus to the boot camp, an army representative handed them a rucksack from the Friends of the IDF Association - inside they found a blue book of psalms wrapped in cellophane. ..."I was infuriated," Sharf said. "I personally don't have anything against giving out the book of psalms, but it should be done by the military rabbinate and not by a benevolent Jew." He added that the next thing would be for Gaydamak to start purchasing tanks, missiles and aircraft for the IDF. "What's going on?" he asked. Um...what? I would understand if a militantly secular citizen would object to Psalms being given out - though I would find that to be a tenuous complaint. But the reasons given here are entirely unconvincing. Can someone explain this story to me in the comments, and perhaps someone can explain why it even is a story??? 1. My Rav (along with many others, judging from the e-mails and comments I have receieved on the matter), has advised against continuing to patronize Gourmet Glatt - though he made it very clear that no Kashering of pots or utensils needs to take place. He went so far as to rule that members of his congregation not even purchase groceries from the store (a full boycott, in essence), as did at least 3 other local Rabbanim that I know of, according to my sources. I have not yet made a decision regarding the boycott, though I will readily admit that I have been buying my meat elsewhere since the first whiff of this scandal emerged, and will continue to do so for the foreseeable future. As far as I have managed to deduce from the information I have received confidentially as well as from what has been publicly released, I feel that Gourmet Glatt was involved in at least some misleading of their customers as far as the proper labeling of chicken is concerned. Though there may now be further safeguards in place to prevent that happening, I still have concerns regarding the level of supervision at the store, and will reserve judgement on whether to resume buying meat there as more of this story plays out. As far as the boycott is concerned, I am not at all sure I am comfortable with a boycott. Whether the store has some questions regarding their Kashrut, I certainly don't think that forbidding the buying of groceries that are clearly marked with a hashgacha is within the purview of the vaad. In my opinion, the Vaad is an organization that is responsible for certifying local food purveyors. They should not necessarily be dictating that the community should not be buying groceries from a vendor who they feel has not played by their rules. All of that being the case, I find it difficult to defy my Rav's authority on a matter such as Kashrut. Also, the owners of the store in question openly flouted the authority of the community's collective Rabbinic body - which certainly makes me inclined to understand why the Vaad felt the need to act in such an authoritative manner. Still, the boycott seems heavy-handed, and I think I need a better reason to be supplied for it than the ones provided up until now. Feel free to make your own judgements. OrthoDad has, and he to some extent disagrees with mine. He pretty much feels that we should not be patronizing the store at all, as recommended by our Rav, but has told me that he will allow me to make the decision for our family. I will (probably) post here when I come to a decision on the matter, though I will probably not buy from there in the interim. 2. Now for some housekeeping: One thing that has shocked and appalled me about the comments on this issue is the absolute maliciousness that I have been seeing. Let's be clear. This issue may clearly be one that is loaded, and it evidently stirs up many differing reactions among my readers. That said, the disgusting nature of the personal attacks against both the community Rabbanim as well as the store owners in question has been completely unacceptable. First, there are issues of Loshon Hara as well as Motzi Shem Ra here which are being violated regularly. Please stop immediately. Second, the rabid anti-Rabbanim rhetoric that is being spewed here is just awful, and I would prefer that my readers find another blog on which to practice it. I have no problem saying that many of the comments which viciously attack particular Rabbanim from the community are coming from a handful of IP addresses, and therefore highly suspicious. I am not impressed with the commenting prowess of the commenter(s) in question. The same person saying it again and again and again, more and more obnoxiously, doesn't make it true, or more convincing. It just makes it rude. Please, everyone. Keep it civil and within the boundaries of normal discourse. If you wouldn't say it to your friend over the the Shabbos table with others present, don't say it here. I am well aware that people may have different standards of Shabbos table propriety than the Orthofamily, but please err on the side of caution here on my blog (and at my Shabbos table, for that matter). These comment threads are for airing out issues and bringing different opinions to light. Not for hurling invectives and insults. Keep that in mind as you contemplate hitting "publish". I know I try to. I absolutely love the extra hour of much-needed sleep that I get the night we switch the clocks back. The part that makes me sad is thinking about the fact that some of my kids will be getting out of school when it's already dark outside. Depressing. Also: Upon recommendations from fire safety experts, please remember to replace the batteries in your smoke detectors every time you change the clocks for DST. The clock-changing provides a perfect reminder for the recommended twice-a-year replacement of batteries. Check out Krum for the latest on "Chickengate". More and more women in Jerusalem’s Geula neighborhood have been complaining of being sprayed with a bleach mix. The attacks mark an escalation of the religious fanatics’ battle against what they refer to as the ‘promiscuity’ on the haredi streets and the infiltration of ‘fashion’ that often times does not correspond with the strict dress codes in the community. ...A vendor at one of the local clothing stores said she felt something wet dripping on her shirt as she was walking down the street. At first she thought someone poured water over her, but later realized that she had been sprayed with bleach. ...Until recently the religious zealots focused their battle against the clothing stores: Last week yeshiva students arrived at a women’s clothing store on Amos Street and destroyed thousands of shekels worth of merchandise with bleach. The store was shut down immediately and a men’s clothing store was set up in its place. About six months ago a store from the same chain was set ablaze in Bnei Brak. I presume that the destruction of other people's property is deemed halachically correct by the crazies who are doing so because they figure that they are preventing people from committing what they believe to be sins. I'm sure it will surprise no one that that sort of reasoning just doesn't resonate with me. I find it difficult to believe that these sorts of scare tactics accomplish much in the way of changing people's dressing or shopping habits in the long run. I also find it difficult to believe that there are many halachic authorities who would recommend this sort of destructive, coercive behavior as the proper course of action. At least I hope there aren't. An attempt to build a Shabbat boundary in Southern California is running into environmental opposition. Observant Jews have applied for permission to build the eruv in the sands of Venice Beach, but environmentalists say the boundary would violate a California law that protects beachside views and bird habitats. The boundary, which would allow observant Jews to carry on Shabbat, is the last part of an eruv began in 2002, The Associated Press reported. aThe California Coastal Commission is expected to decide on the $20,000 proposal — the costs would be picked up by a local synagogue — next month. I would be interested in knowing whether the Eruv actually poses a risk to the environment and wildlife, or whether this is just a technicality that is being cited as an easy way to oppose making a religious acommodation. An owner of a major kosher supermarket in the Five Towns says he has been given an ultimatum by the organization that provides him with kosher supervision: either sell his business by Feb. 1 or it will withdraw its kosher supervisors. Mark Bollander, [sic] a partner of Gourmet Glatt Kosher Meat Market in Cedarhurst, told The Jewish Week that the threat was made by the Vaad Hakashrus of the Five Towns and Rockaway, which has virtually dominated supervision of kosher establishments in the Five Towns for about 30 years. Riiiight. This had nothing to do with the fact that there was a huge and extremely public conflict over allegations of whether Mr. Bolender's store was found to be labeling one brand of chicken for another. “It is taking away their ability to make a living over something that has nothing to do with kashrut,” he said. “Even if they wanted to open another business elsewhere they would not be deemed to be worthy of another Vaad giving them [supervision]. Clearly this is not a question of kashrut because if it was, why would they wait until Feb. 1? Unless their reasoning was extremely sound, this is not the way to go. Their job is to watch out for kashrut” and nothing more. Nice to see the Jewish Week in good form, providing their readers with a story that, as usual, has the least possible relevance to the actual news. 1) A outspoken local Rav addressed the situation this Shabbat. Though he continued to maintain that buying from Gourmet Glatt is no problem from a Kashrut perspective, he expressed outrage at the owner's of Gourmet Glatt for their decision to employ a second Hashgacha and to tout this as an enhancement of the store's Kashrut standards, and said that the Vaad is considering its legal and halachic options. He was extremely critical of Gourmet Glatt (and the new Rav Hamachsir) for bringing in the second certification without first consulting with the Vaad.As he explained, the issues with Gourmet Glatt were not just along the lines of mislabeled chickens, but included other issues that he declined to specify. He said the Vaad had been working together with Gourmet Glatt to solve the issues the store had without putting it out of business when the store decided to contract the new Hashgacha.He seemed to view Gourmet Glatt's decision as a betrayal of the Vaad and a violation of the good faith that the Vaad was showing Gourmet Glatt. He also pointed out that it would be mistaken for consumers to assume that two Hashgachot are better than one (though his analogy, that eleven fingers isn't better than ten was not exactly the best). One of the country's major suppliers of kosher chickens, Empire Kosher, which has nothing to do with the rogue butcher, is responding to consumer fears by considering changing the way it packages chickens, Genack said. The company currently sells 30 chickens in a box of ice, but Empire is considering selling only chickens wrapped individually and not allowing butchers to open them, he said. Then the customer will buy the chicken, and the butcher can unwrap and cut it in front of the customer, he said. I'm not sure if this new policy proposal is a reaction only to the Monsey scandal, or to the mislabeling of chickens and sunsequent allegations of stores attempting to intentionally mislead customers that have surfaced in the wake of the local Gourmet Glatt story. Shifra may not have seen much of this this style before, but I am quite familiar. It is the style of choice for most young turkettes in the Five Towns. Not getting enough sleep may play a role in youngsters becoming overweight, partly by disrupting normal metabolism, a doctor contends in a report released yesterday. The current epidemic of obesity has been driven largely by environmental factors - an unhealthy diet and a lack of physical activity, Dr. Shahrad Taheri of England's University of Bristol points out in the Archives of Disease in Childhood. Taheri writes that research suggests that sleep may impact energy balance and that short sleep duration may lead to metabolic changes that could help fuel the development of obesity, diabetes and cardiovascular disease. Great. Add it to the list, people. Add it to the list. I have been a bit swamped with work due to a crushing Yom Tov-induced backlog, so please excuse the slower blogging schedule. Gourmet Glatt made the announcement in a statement sent to The Jewish Star. Vaad Hakashrus administrator Rabbi Yosef Eisen learned of the hiring of Rabbi Yehuda Kravitz from a reporter. Rabbi Eisen said that Gourmet Glatt's hashgacha from the Vaad is "in jeopardy" and said the members of the Vaad would meet to "render a final decision." Gourmet Glatt also announced that customers would be able to assuage fears of kashrut or business issues by supervising the store's activity for themselves, through the installation of video cameras throughout the store, with a feed to a publicly viewable internet site. Large advertisements in the local Jewish papers proclaim the store's new Hashgacha as well as the new surveillance system. Not sure that a surveillance system or the new hashgacha is the cure to Gourmet Glatt's ills here. First, if there are questions of proper supervision, I find it difficult to believe that a live feed of some views of the interior of the store in question is going to be a panacea. I also don't personally feel that the new Hashgacha is quite as reassuring as the advertisements and statements on the part of the store seem to hope they will be. Especially if the Vaad drops the store's certification - which a source tells me they met tonight to consider. I haven't posted on the topic in a little while, but the District 15 public/private school battles rage on. One recent issue that's been particularly contentious is the claim by some private school parents that their children's bus service had been changed this year, creating a tremendous amount of inconvenience for many district students. In response to the outcry on the part of parents, some of whose children had been given absurdly early pickup times or unsafe bus stops, the school board set up a fact-finding meeting that was attended by many parents. After this meeting, the district's findings were that this was not a deliberate act aimed at "punishing" the private school community for sending the budget to contingency, but an error on the part of the district's transportation office that would be ironed out in due time. People on both sides were willing to accept that finding at face value, and the controversy seemed to die down. But not for long. Not "allegations that school bus plays favorites". Just "school bus plays favorites". As if that is borne out in the article. Which it isn't. But in a revelation that has roiled the already divided district, it turns out that for years, in violation of district policy, some 300 stops were in front of homes of private school students and that some parents were bribing drivers with gifts and cash. All the while, most public school kids have had to walk to corner stops. Why that happened isn't clear. Some public school parents said that for years they noticed that when they drove behind a bus, it made many stops on one street. But when they questioned school officials, they were told there were no special house stops. But where's the proof of that allegation? There is none in the article. None. Absolutely not a shred. Is there a bus driver who was interviewed by the reporter, who backs up these amorphous claims of bribery? No. Does the superintentent of the district, who is quoted in the article, himself allege that bribing took place, or specify that he feels the private school community got preferential treatment? No. Renee Freedman of Lawrence said the bus stopped in front of her house for the past 21 years, which brought hisses and groans from the public school crowd. After the meeting, she explained that her stop also served about 10 other children on her block. "It shouldn't be considered door-to-door pickup," she said. "It's a convenient stop for the kids who live in that area." Now, the bus passes her house to get to a stop about two-tenths of a mile away, where fewer students live, she said. "To go to that corner doesn't make sense," she said. Um, this is the door-to-door pickup that the reporter is claiming as fact? A stop that picks up ten children on one block, and happens to be in front of one of the children's houses? Well, according my fabulous math skillz, it would seem to me that 9 out of the 10 private school students who get picked up at that stop are not getting home stops. So this doesn't seem to be about preferential treatment in the past - just about one lucky student who happened to be in extremely close proximity to the stop. Private school parent Michelle Muehlgay of Cedarhurst, who complained of no longer having a bus stop in front of her home, said busing is a small privilege for the taxes she pays toward a school district she doesn't use. Um, ok? So the stop was in front of her house and was now moved? Who says that the stop in front of her house wasn't the one given to her by the district transportation office? Did the reporter care to follow up? Did he check if this particular family lives on a corner, in which case, not stopping in front of their house would be silly? It's one thing to have a policy of not acommodating parents' requests for stop changes to in front of student's homes, but some stops simply start out that way due to convenience. I would be extremely incensed if I would find out the that school district was deliberately placing stops away from student's homes, whether in public or private school, just to keep to a "policy". Public school parent Andrew Levy, of Atlantic Beach, said he grew up in the area and never had a bus stop in front of his house. He added that perhaps busing would not be so controversial if the community as a whole were more supportive of the district's financial needs. Well, if Andrew Levy says that he grew up in the area and never got a bus stop in front of his house, then there must be no public school students who ever got a stop in front of their house. Right? Isn't that the way logic works? Well, obviously not. The reporter from Newsday seems to be relying on the public school community's mad math skillz. Bad idea. This two-bit reporter expects us to sit idly by and allow her to write an article that is pure drivel? An article that uses two examples of private school parents' experience vs. one example of public school parents' experience - and that is reporting?? Please, everyone, if you have a minute, dash off a letter to Newsday's editor. When people calling themselves reporters produce garbage like this that doesn't belong in print, there needs to be a public outcry. And I'm talking to people on both sides of the community divide. If there's a point to be made, then please, by all means, make it. But this article is nothing but a hit job with nothing but allegations that are never borne out by evidence. And I am hopping mad that this piece of biased drivel that doesn't even belong...well, on a blog, could find its way into a paper that fancies itself a real publication. My readers should be equally incensed. The topic of the week seems to be the operating of JCC's on Saturdays and Jewish holidays. In this piece from the NY Sun, the Staten Island Orthodox community is up in arms over their local JCC planning to remain open on Saturdays. And the topic in general of JCC's operating on Shabbat and holidays is addressed in this week's Jewish Week as well. In Staten Island, the JCC seems to have gone to great pains to remain inclusive to all members of the Jewish community. They have instituted a schedule of separate swimming hours for men and women, as well as a Sunday sports program to acommodate Shabbat observers. The question seems to be whether the JCC should be similarly inclusive of non-observant Jews by allowing them the option of recreating on Saturdays. My knee-jerk response was that it seems to me to be unreasonable for Staten Island's Orthodox community to expect a non-Orthodox Jewish association to follow rules that they do not consider applicable to them. Though I do feel that it would be great if the JCC would have agreed instantly to close on Saturdays to minimize the public desecration of Shabbat, it just seems unrealistic in the year 2006 to have that expectation, and seems like the Orthodox who oppose it are themselves risking being seen as less then inclusive. When I mentioned the topic to OrthoDad, however, he had a different take. While he agrees that it might be an unrealistic goal for the Staten Island Orthodox community, he feels that their uproar is perfectly justified. As he pointed out, as Orthodox Jews, though we might respect those who are not observant, we should never view that as a desirable life choice, and no amount interest in being inclusive can stand in the way of that inescapable fact. And so although my thoughts on the matter tend toward more of a live-and-let-live kind of attitude, I can see where my husband has a point. He also pointed out that the Orthodox community in Baltimore, MD organized an uproar over a similar proposal by the local JCC to open on Saturdays, and that they were successful in getting the proposal rejected. Interestingly, some of the complaints in the Jewish Week piece come from a family who are self-described as "somewhat observant" Conservative Jews who objected to the fact that the 92nd St. Y had scheduled some of their son's art classes over Sukkot and Simchat Torah, which actually tells us that this issue isn't just an Orthodox one. So what's my word on the subject? I can understand JCC's remaining open on Saturdays and holidays - but I would love to see them draw the line at doing so only for Shabbat and Yom Tov programming, especially as the articles point out that most do not allow money to change hands on those days. I am aware that there are people who probably rely on these associations for much of their Jewish connections, and I can understand such programs' value. Still, the thought of an organization calling itself a Jewish one and yet routinely scheduling extracurricular classes of a non-Jewish theme, scheduling sports leagues, or opening their gym on Shabbat and holidays does get to me. Does it get to me enough to stand outside and protest? Well, probably not. But I'm not sure that the fact that in this day and age, I'm so inured to the trangression of Shabbat that I can shrug it off is something to be particularly proud of. The great Five Towns blogger MoChassid has put out an awesome CD in memory of his father. The CD, titled U'Shmuel B'Korei Sh'mo is a compilation of tunes by some of my favorite Jewish artists, including Avrohom Rosenblum, Chaim Dovid, Shlomo Katz and Yosef Karduner. It has already established itself as the clear winner in the contest for the OrthoFamily's soundtrack of choice for Sukkot 5767 - it has basically been playing nonstop 'round here. My personal favorite is Yom Shabason by Aron Razel, while OrthoDad keeps hitting repeat on Track 1 (The Ganz'e Tance by Chaim Dovid & Shlomo Katz). Click here for info and clips of all the songs. To sum up, in the words of my oldest: This CD rocks. The Jewish Star files another dispatch on the Five Towns chicken controversy I blogged about here and here. Let me begin by saying that the Jewish Star's new editor continues to impress me with his thorough reporting and his clear insistence in following a story - no matter where it might take him, and who in the "establishment" it might annoy. We have a woeful dearth of responsible yet truthful and hard-hitting reporting on issues that pertain to the Orthodox community, so any steps in that direction are welcomed. The owners of Gourmet Glatt Emporium said they now believe that a one-and-a-half-pound Cornish hen their store was accused of mislabeling may have been an Empire bird after all, deep-frozen months ago, before Empire stopped producing birds of that weight. ...Bolender acknowledged that Empire no longer sold one-and-a-half pound birds. He said he believed the chicken that was the subject of a consumer complaint to Empire and was later found to have been mislabeled actually was made by Empire, and frozen. "It's possible these hens were from older shipments. I didn't agree with their fundamental findings," Bolender said, referring to the Vaad Hakashrus of the Five Towns and Rockaway. Okay. So Mr. Bolender seems to claim to have information that would seem to cause him to believe that the chicken that he sold was, in actuality, an Empire chicken, sold by his store after being frozen for over nine months. Fine. That's an intriguing, and seemingly plausible, line of defense. My only real questions with that line of defense are: (a)How does that theory jibe with the fact that last week, a spokesman for Empire was quoted as saying that the chicken was cut in a way that the Empire machines are not capable of producing, and (b)Why did it take Mr. Bolender two weeks (and two extremely damaging news cycles) to come up with this defense? Bolender objected to the fact that he had never been offered the opportunity to confront the person who made the original complaint, and had not seen any proof, such as a register receipt, that the chicken was actually purchased in his store. "I would be ready at any time to face my accuser," he said, "to see my receipt, my label and my alleged product, when it could have been from another store." So, wait. Mr. Bolender first claims to have an idea of how the type of chicken that Empire says it no longer sells got sold from his store - and then he raises the question of whether it was actually bought at his store? Which is it? He said the other chicken believed to have been mislabeled was stored in his freezer at home, following its discovery by Rabbi Eisen. Twenty-five thousand different packages came out of the Gourment Glatt meat room over the holiday season. Bolender said he strives for 100 percent accuracy, but acknowledged that mistakes will happen. Um, so, again? Which is it? Was the chicken in actuality a frozen Empire chicken, was it actually a chicken sold at another store, or was it a human error that could happen to anyone? I have no judgement as to whether any of the defenses presented by Mr. Bolender are true, but I do know that the triple lines of defense are confusing and seem contradictory. If I were him, I would try to pick a story and stick to it. Deep-freezing meat and poultry is a common industry practice, done to avoid supply interruptions, Bolender explained. Small notices in his meat and poultry cases alert customers that while most of what the store sells is fresh, some chickens and certain cuts of meat have been frozen to 15 degrees below zero, then carefully thawed and offered for sale at times of great demand. He said that when done properly, such freezing had no impact on taste. Q. May I refreeze the food in the freezer if it thawed or partially thawed? A. Yes, the food may be safely refrozen if the food still contains ice crystals or is at 40 °F or below. Well, let's consider how that figures into the following scenario. I purchase chicken at Gourmet Glatt (or, if Mr. Bolender's claim that the practice freezing and thawing is an industry-wide practice is true, any other kosher market). Said chicken has been deep-frozen and thawed by the vendor. Then I put chicken in my car and do another errand or two. By the time I get home, the chicken is still quite cold when I refreeze it for later use - but has it been exactly below 40 degrees at all times, as recommended by the USDA's guidelines? No clue. But I also had no clue that it was required to be kept below that temperature, due to its potential frozen/thawed status. Is this claimed "industry-wide" practice as outlined by Mr. Bolender a food safety issue? Anyone have a clue? A person knowledgeable of the history of the relationship between Gourmet Glatt and the Vaad Hakashrus told The Jewish Star, "He's missing the point, as usual." The person was granted anonymity so as not to give the impression of public disagreementwith the Vaad's handling of the situation. "It's less about the bird than the word. Whenever Bolender is confronted it's always duck and dodge." He said the store's history with the Vaad was marked with mistrust as a result of different episodes over the years. He declined to go into detail but said, "hashgacha is there to catch mistakes, but it assumes a basic amount of trust" which, he said, does not exist. I just don't like the whole quote. Anyone who reads my blog knows how I feel about anonymous critics who take potshots at individuals in the news - which unfortunately seems to be a far too common occurence. I think it stinks. It's one thing if an anonymous source supplies certain facts that are essential to a story but insists on anonymity for personal or professional reasons. But when a source, who may or may not have a personal vendetta or axe to grind, levels criticism or poorly characterizes a subject in a newspaper article and then hides behind a veil of anonimity, I just hate it. If the source feels the urge come on to anonymously level criticism at someone/something, let him do what I did. Start a blog. Anonymous bloggers give up a large chunk of credibility by remaining anonymous - and that is something I am fully aware of. But we look to news for a far different service - facts. Mr. Bolender may or may not have been wronged here by the Vaad - I have no idea, and am in no place to judge. We can just hope the facts will eventually come out. I will say , however, that he has clearly been done a disservice at the hands of the anonymous source who brings nothing but innuendo and supposition to the conversation. Given the lack of trust, why does the Vaad continue to provide its hashgacha to the store? "Because they trust the supervision," explained The Jewish Star’s source. Huh? Which is it? First he says there are trust issues. Then he says that the Vaad does trust the supervision that Gourmet Glatt is hiring? What in the world is our anonymous source trying to say? Unclear. All in all, the Five Towns Chicken Scandal (That Wasn't?) just seems to get murkier and murkier as the he said/she said continues. Doesn't the Kosher consumer deserve better than this? More on the Five Towns Kosher Chicken "Scandal"
The Jewish Star, the paper that broke last week's story of possible mislabeling of kosher chickens by an area kosher supermarket, has published a follow-up story in this week's edition. They answer many of the questions about the affair that still remained up in the air last week, but some still have not been answered to my satisfaction by the parties involved. Two weeks ago a consumer, whom Empire would not identify, purchased two Cornish hens at Gourmet Glatt. Packaged together on one tray under the Empire name, neither bore a plumba, or identifying metal tag, which apparently sparked the customer's concern. Empire does not package Cornish hens for sale in that manner. Rosenbaum said that an analysis by the company revealed that "the way this particular bird was cut was done by a machine that we do not own. "The bird weighed one-and-a-half-pounds, and Empire hasn't sold Cornish hens at that weight in eight months. Empire notified the Vaad Hakashrus of the Five Towns and Rockaway, which made a surprise inspection at Gourmet Glatt. Acting on information from Empire, specifically about the weight of available Empire Cornish hens, Rabbi Eisen said he personally discovered more than one mislabeled chicken in the display case. He said there was no way to know if any others had been sold prior to the inspection. So, as implied but not confirmed in the paper last week, it seems that Gourmet Glatt was misleading customers into purchasing non-Empire products at Empire (i.e., more expensive) prices. Was it deliberate? Last week's article echoes Gourmet Glatt's claim of a "clerical error", this week's article doesn't come out and make a judgement one way or the other. Word I've gotten from a reliable source involved in comunity Kashrut affairs? It is believed the mislabeling was deliberate. Rabbi Yosef Eisen of the Vaad Hakashrus of the Five Towns and Rockaway defended the new labeling guidelines on the grounds that there are limits to what is possible. "We'd have to hire an army to police people's mouths," he said. ...Rabbi Eisen said that labels on meat and poultry at Gourmet Glatt would continue to reflect different prices per pound as charged by different suppliers. "Consumers - when it comes specifically to provisions such as meat and poultry - know the range of what it is going to cost," he said. He believes customers who pick up a significantly more expensive package of chicken will either understand that they are buying Empire, which charge anywhere from 5 to 30 cents more per-pound than competitors, or, Rabbi Eisen believes, they will ask. Okay, so let me get this straight. Gourmet Glatt, due to being discovered as having been mislabeling chicken - whether due to fraud or a "clerical error" - is no longer allowed to label their repackaged chicken. The Vaad's representative defends the new policy, explaining that the store can't be policed. However, he then goes on to explain that consumers should have no problem determining which chicken is Empire brand, by reading an unwritten code - which is the per/pound pricing of the chicken. So Gourmet Glatt somehow can't be trusted to actually print the Empire name on its packaging, yet they can be trusted to charge Empire prices. Wasn't this, as the Vaad has taken great pains to inform us, all about charging proces that were higher than appropriate and NOT about Kashrut problems? If that's the case, to the extent that the Vaad does not feel it can police Gourmet Glatt to label their chickens properly, then why are we to assume that anything will change regarding the proper pricing of the product? The whole "solution" to the problem just doesn't seem to add up. Relief from Duties On Grounds of Intolerance? London's police chief on Thursday launched an urgent review of a decision not to post a Muslim officer at the Israeli embassy after a newspaper reported that he had been excused on moral grounds. PC Alexander Omar Basha, who is attached to the force's Diplomatic Protection Group, objected to being posted to protect Israel's embassy in central London from possible terrorist attack because he disagreed with the country's bombing of Lebanon during the recent war. According to British newspaper 'the Guardian', the officer had reportedly attended a recent anti-war protest. Police chiefs excused Basha last week but critics said they feared it would open the floodgates for officers of any religion or belief to refuse to carry out certain duties. John O'Connor, a former Metropolitan Police flying squad commander, told the London-based Sun newspaper: "This is the beginning of the end for British policing." "If they can allow this, surely they'll have to accept a Jewish officer not wanting to work at an Islamic national embassy. Will Catholic cops be let off working at Protestant churches? Where will it end? This decision is going to allow officers to work in a discriminating and racist way," he added. I completely agree. To allow one such special dispensation out of concern for an officer's intolerance (or, to put it euphemistically, his "political views") is clearing the road for all sorts of intolerant (or politically motivated) requests to be considered. Not a direction I would want to see any police force heading in the year 2006. The OrthoFamily is spending the Yom Tov traveling in an undisclosed location. I will post when I can (or when I get internet access). Keep checking back for new posts! I would like to take this opportunity to wish a Gmar Chatima Tova and an easy and meaningful fast to all. I would also like to ask mechila from anyone who I might have offended or unfairly maligned through my blog.